Peeling paint on historic wood siding. Photo: ©John Leeke, 2002. A cautionary approach to paint removal is included in the guidelines to the Secretary of the Interior Standards for Rehabilitation. Removing paints down to bare wood surfaces using harsh methods can permanently damage those surfaces; therefore such methods are not recommended. Also, total removal obliterates evidence of the historical paints and their sequence and architectural context. This Brief expands on that advice for the architect, building manager, contractor, or homeowner by identifying and describing common types of paint surface conditions and failures, then recommending appropriate treatments for preparing exterior wood surfaces for repainting to assure the best adhesion and greatest durability of the new paint. Although the Brief focuses on responsible methods of "paint removal," several paint surface conditions will be described which do not require any paint removal, and still others which can be successfully handled by limited paint removal. In all cases, the information is intended to address the concerns related to exterior wood. It will also be generally assumed that, because houses built before 1950 involve one or more layers of lead-based paint, the majority of conditions warranting paint removal will mean dealing with this toxic substance along with the dangers of the paint removal tools and chemical strippers themselves. The paint on this exterior decorative feature is sound. Photo: NPS files. Paint applied to exterior wood must withstand yearly extremes of both temperature and humidity. While never expected to be more than a temporary physical shield—requiring reapplication every 5 to 8 years—its importance should not be minimized. Because one of the main causes of wood deterioration is moisture penetration, a primary purpose for painting wood is to exclude such moisture, thereby slowing deterioration not only of a building's exterior siding and decorative features but, ultimately, its underlying structural members. Another important purpose for painting wood is, of course, to define and accent architectural features and to improve appearance. Exterior paint is constantly deteriorating through the processes of weathering, but in a program of regular maintenance—assuming all other building systems are functioning properly—surfaces can be cleaned, lightly scraped, and hand sanded in preparation for a new finish coat. Unfortunately, these are ideal conditions. More often, complex maintenance problems are inherited by owners of historic buildings, including areas of paint that have failed beyond the point of mere cleaning, scraping, and hand sanding (although much so-called "paint failure" is attributable to interior or exterior moisture problems or surface preparation and application mistakes with previous coats). 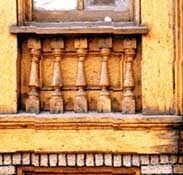 Although paint problems are by no means unique to historic buildings, treating multiple layers of hardened, brittle paint on complex, ornamental—and possibly fragile—exterior wood surfaces necessarily requires an extremely cautious approach. In the case of recent construction, this level of concern is not needed because the wood is generally less detailed and, in addition, retention of the sequence of paint layers as a partial record of the building's history is not an issue. When historic buildings are involved, however, a special set of problems arises—varying in complexity depending upon their age, architectural style, historical importance, and physical soundness of the wood—which must be carefully evaluated so that decisions can be made that are sensitive to the longevity of the resource. When the protective and decorative paint finish was removed and an inappropriate clear finish applied, the exterior character of the building was altered. Photo: NPS files. At the outset of this Brief, it must be emphasized that removing paint from historic buildings—with the exception of cleaning, light scraping, and hand sanding as part of routine maintenance—should be avoided unless absolutely essential. Once conditions warranting removal have been identified the general approach should be to remove paint to the next sound layer using the gentlest means possible, then to repaint. Practically speaking as well, paint can adhere just as effectively to existing paint as to bare wood, providing the previous coats of paint are also adhering uniformly and tightly to the wood and the surface is properly prepared for repainting— cleaned of dirt and chalk and dulled by sanding. But, if painted exterior wood surfaces display continuous patterns of deep cracks or if they are extensively blistering and peeling so that bare wood is visible, then the old paint should be completely removed before repainting. The only other justification for removing all previous layers of paint is if doors, shutters, or windows have literally been "painted shut," or if new wood is being pieced-in adjacent to old painted wood and a smooth transition is desired. Because paint removal is a difficult and painstaking process, a number of costly, regrettable experiences have occurred—and continue to occur—for both the historic building and the building owner. Historic buildings have been set on fire with blow torches; wood irreversibly scarred by sandblasting or by harsh mechanical devices such as rotary sanders and rotary wire strippers; and layers of historic paint inadvertently and unnecessarily removed. In addition, property owners, using techniques that substitute speed for safety, have been injured by toxic lead vapors or dust from the paint they were trying to remove or by misuse of the paint removers themselves. Owners of historic properties considering paint removal should also be aware of the amount of time and labor involved. 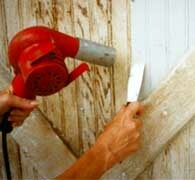 While removing damaged layers of paint from a door or porch railing might be readily accomplished within a reasonable period of time by one or two people, removing paint from larger areas of a building can, without professional assistance, easily become unmanageable and produce less than satisfactory results. The amount of work involved in any paint removal project must therefore be analyzed on a case-by-case basis. Hiring qualified professionals will often be a cost-effective decision due to the expense of materials, the special equipment required, and the amount of time involved. Further, paint removal companies experienced in dealing with the inherent health and safety dangers of paint removal should have purchased such protective devices as are needed to mitigate any dangers and should also be aware of State or local environmental and/or health regulations for hazardous waste disposal. All in all, paint removal is a messy, expensive, and potentially dangerous aspect of rehabilitating or restoring historic buildings and should not be undertaken without careful thought concerning first, its necessity, and second, which of the available recommended methods is the safest and most appropriate for the job at hand. If existing exterior paint on wood siding, eaves, window sills, sash, and shutters, doors, and decorative features shows no evidence of paint deterioration such as chalking, blistering, peeling, or cracking, then there is no physical reason to repaint, much less remove paint! Nor is color fading, of itself, sufficient justification to repaint a historic building. When the paint on the wood windows became too thick, it was removed and the window repainted. Photo: NPS files. The decision to repaint may not be based altogether on paint failure. Where there is a new owner, or even where ownership has remained constant through the years, taste in colors often changes. Therefore, if repainting is primarily to alter a building's primary and accent colors, a technical factor of paint accumulation should be taken into consideration. When paint builds up to a thickness of approximately 1/16" (approximately 16 to 30 layers), one or more extra coats of paint may be enough to trigger cracking and peeling in limited or even widespread areas of the building's surface. This results because excessively thick paint is less able to withstand the shrinkage or pull of an additional coat as it dries and is also less able to tolerate thermal stresses. Thick paint invariably fails at the weakest point of adhesion—the oldest layers next to the wood. Cracking and peeling follow. Therefore, if there are no signs of paint failure, it may be somewhat risky to add still another layer of unneeded paint simply for color's sake (extreme changes in color may also require more than one coat to provide proper hiding power and full color). When paint appears to be nearing the critical thickness, a change of accent colors (that is, just to limited portions of the trim) might be an acceptable compromise without chancing cracking and peeling of paint on wooden siding. If the decision to repaint is nonetheless made, the "new" color or colors should, at a minimum, be appropriate to the style and setting of the building. On the other hand, where the intent is to restore or accurately reproduce the colors originally used or those from a significant period in the building's evolution, they should be based on the results of a paint analysis. The problem evidenced here by mossy growth and deteriorated wood must be resolved and the wood allowed to dry out before the wood is repainted. Photo: NPS files. It is assumed that a preliminary check will already have been made to determine, first, that the painted exterior surfaces are indeed wood—and not stucco, metal, or other wood substitutes—and second, that the wood has not decayed so that repainting would be superfluous. For example, if any area of bare wood such as window sills has been exposed for a long period of time to standing water, wood rot is a strong possibility. Repair or replacement of deteriorated wood should take place before repainting. After these two basic issues have been resolved, the surface condition identification process may commence. The historic building will undoubtedly exhibit a variety of exterior paint surface conditions. For example, paint on the wooden siding and doors may be adhering firmly; paint on the eaves peeling; and paint on the porch balusters and window sills cracking and alligatoring. The accurate identification of each paint problem is therefore the first step in planning an appropriate overall solution. Paint surface conditions can be grouped according to their relative severity: CLASS I conditions include minor blemishes or dirt collection and generally require no paint removal; CLASS II conditions include failure of the top layer or layers of paint and generally require limited paint removal; and CLASS III conditions include substantial or multiple-layer failure and generally require total paint removal. It is precisely because conditions will vary at different points on the building that a careful inspection is critical. Each item of painted exterior woodwork (i.e., siding, doors, windows, eaves, shutters, and decorative elements) should be examined early in the planning phase and surface conditions noted. Dirt, Soot, Pollution, Cobwebs, Insect Cocoons, etc. Environmental "grime" or organic matter that tends to cling to painted exterior surfaces and, in particular, protected surfaces such as eaves, do not constitute a paint problem unless painted over rather than removed prior to repainting. If not removed, the surface deposits can be a barrier to proper adhesion and cause peeling. Most surface matter can be loosened by a strong, direct stream of water from the nozzle of a garden hose. Stubborn dirt and soot will need to be scrubbed off using l/2 cup of household detergent in a gallon of water with a medium soft bristle brush. The cleaned surface should then be rinsed thoroughly, and permitted to dry before further inspection to determine if repainting is necessary. Quite often, cleaning provides a satisfactory enough result to postpone repainting. 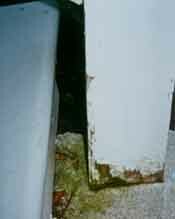 Mildew is caused by fungi feeding on nutrients contained in the paint film or on dirt adhering to any surface. Because moisture is the single most important factor in its growth, mildew tends to thrive in areas where dampness and lack of sunshine are problems such as window sills, under eaves, around gutters and downspouts, on the north side of buildings, or in shaded areas near shrubbery. It may sometimes be difficult to distinguish mildew from dirt, but there is a simple test to differentiate: if a drop of household bleach is placed on the suspected surface, mildew will immediately turn white whereas dirt will continue to look like dirt. Because mildew can only exist in shady, warm, moist areas, attention should be given to altering the environment that is conducive to fungal growth. The area in question may be shaded by trees which need to be pruned back to allow sunlight to strike the building; or may lack rain gutters or proper drainage at the base of the building. If the shady or moist conditions can be altered, the mildew is less likely to reappear. A recommend solution for removing mildew consists of one cup non-ammoniated detergent, one quart household bleach, and one gallon water. When the surface is scrubbed with this solution using a medium soft brush, the mildew should disappear; however, for particularly stubborn spots, an additional quart of bleach may be added. After the area is mildew-free, it should then be rinsed with a direct stream of water from the nozzle of a garden hose, and permitted to dry thoroughly. When repainting, specially formulated "mildew-resistant" primer and finish coats should be used. Chalking—or powdering of the paint surface—is caused by the gradual disintegration of the resin in the paint film. (The amount of chalking is determined both by the formulation of the paint and the amount of ultraviolet light to which the paint is exposed.) In moderation, chalking is the ideal way for a paint to "age," because the chalk, when rinsed by rainwater, carries discoloration and dirt away with it and thus provides an ideal surface for repainting. In excess, however, it is not desirable because the chalk can wash down onto a surface of a different color beneath the painted area and cause streaking as well as rapid disintegration of the paint film itself. Also, if a paint contains too much pigment for the amount of binder (as the old white lead carbonate/oil paints often did), excessive chalking can result. The chalk should be cleaned off with a solution of l/2 cup household detergent to one gallon water, using a medium soft bristle brush. After scrubbing to remove the chalk, the surface should be rinsed with a direct stream of water from the nozzle of a garden hose, allowed to dry thoroughly, (but not long enough for the chalking process to recur) and repainted, using a non-chalking paint. Staining of paint coatings usually results from excess moisture reacting with materials within the wood substrate. There are two common types of staining, neither of which requires paint removal. The most prevalent type of stain is due to the oxidation or rusting of iron nails or metal (iron, steel, or copper) anchorage devices. A second type of stain is caused by a chemical reaction between moisture and natural extractives in certain woods (red cedar or redwood) which results in a surface deposit of colored matter. This is most apt to occur in new replacement wood within the first 10-15 years. In both cases, the source of the stain should first be located and the moisture problem corrected. Discoloration due to color extractives in replacement wood can usually be cleaned with a solution of equal parts denatured alcohol and water. After the affected area has been rinsed and permitted to dry, a "stainblocking primer" especially developed for preventing this type of stain should be applied (two primer coats are recommended for severe cases of bleeding prior to the finish coat). Each primer coat should be allowed to dry at least 48 hours. Crazing—or surface cracking—is an exterior surface condition which can be successfully treated by sanding and painting. Photo: Courtesy, National Decorating Products Assocation. 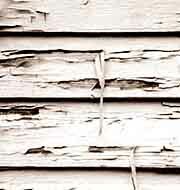 Crazing—fine, jagged interconnected breaks in the top layer of paint—results when paint that is several layers thick becomes excessively hard and brittle with age and is consequently no longer able to expand and contract with the wood in response to changes in temperature and humidity. As the wood swells, the bond between paint layers is broken and hairline cracks appear. Although somewhat more difficult to detect as opposed to other more obvious paint problems, it is well worth the time to scrutinize all surfaces for crazing. If not corrected, exterior moisture will enter the crazed surface, resulting in further swelling of the wood and, eventually, deep cracking and alligatoring, a Class III condition which requires total paint removal. Crazing can be treated by hand or mechanically sanding the surface, then repainting. Although the hairline cracks may tend to show through the new paint, the surface will be protected against exterior moisture penetration. Here, a latex top coat was applied directly over old oil paint, resulting in intercoat peeling. The latex was unable to adhere. If latex is used over oil, an oil-base primer should be applied first. Photo: Mary L. Oehrlein, AIA. Intercoat peeling can be the result of improper surface preparation prior to the last repainting. This most often occurs in protected areas such as eaves and covered porches because these surfaces do not receive a regular rinsing from rainfall, and salts from airborne pollutants thus accumulate on the surface. If not cleaned off, the new paint coat will not adhere properly and that layer will peel. Another common cause of intercoat peeling is incompatibility between paint types. For example, if oil paint is applied over latex paint, peeling of the top coat can sometimes result since, upon aging, the oil paint becomes harder and less elastic than the latex paint. If latex paint is applied over old, chalking oil paint, peeling can also occur because the latex paint is unable to penetrate the chalky surface and adhere. First, where salts or impurities have caused the peeling, the affected area should be washed down thoroughly after scraping, then wiped dry. Finally, the surface should be hand or mechanically sanded, then repainted. Where peeling was the result of using incompatible paints, the peeling top coat should be scraped and hand or mechanically sanded. Application of a high quality oil type exterior primer will provide a surface over which either an oil or a latex topcoat can be successfully used. Solvent blistering, the result of a less common application error, is not caused by moisture, but by the action of ambient heat on paint solvent or thinners in the paint film. If solventrich paint is applied in direct sunlight, the top surface can dry too quickly and, as a result, solvents become trapped beneath the dried paint film. When the solvent vaporizes, it forces its way through the paint film, resulting in surface blisters. This problem occurs more often with dark colored paints because darker colors absorb more heat than lighter ones. To distinguish between solvent blistering and blistering caused by moisture, a blister should be cut open. If another layer of paint is visible, then solvent blistering is likely the problem whereas if bare wood is revealed, moisture is probably to blame. Solvent blisters are generally small. Solvent-blistered areas can be scraped, hand or mechanically sanded to the next sound layer, then repainted. In order to prevent blistering of painted surfaces, paint should not be applied in direct sunlight. Wrinkled layers can generally be removed by scraping and sanding as opposed to total paint removal. Photo: Courtesy, National Decorating Products Association. Another error in application that can easily be avoided is wrinkling. This occurs when the top layer of paint dries before the layer underneath. The top layer of paint actually moves as the paint underneath (a primer, for example) is drying. Specific causes of wrinkling include: (1) applying paint too thick; (2) applying a second coat before the first one dries; (3) inadequate brushing out; and (4) painting in temperatures higher than recommended by the manufacturer. The wrinkled layer can be removed by scraping followed by hand or mechanical sanding to provide as even a surface as possible, then repainted following manufacturer's application instructions. 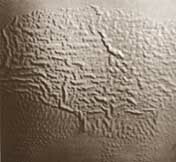 If surface conditions are such that the majority of paint will have to be removed prior to repainting, it is suggested that a small sample of intact paint be left in an inconspicuous area either by covering the area with a metal plate, or by marking the area and identifying it in some way. (When repainting does take place, the sample should not be painted over). This will enable future investigators to have a record of the building's paint history. Extensively deteriorated paint needs to be removed to bare wood, then primed and re-painted. Photo: NPS files. 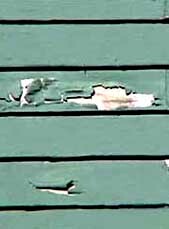 Peeling to bare wood is most often caused by excess interior or exterior moisture that collects behind the paint film, thus impairing adhesion. Generally beginning as blisters, cracking and peeling occur as moisture causes the wood to swell, breaking the adhesion of the bottom layer. There is no sense in repainting before dealing with the moisture problems because new paint will simply fail. Therefore, the first step in treating peeling is to locate and remove the source or sources of the moisture, not only because moisture will jeopardize the protective coating of paint but because, if left unattended, it can ultimately cause permanent damage to the wood. Excess interior moisture should be removed from the building through installation of exhaust fans and vents. Exterior moisture should be eliminated by correcting the following conditions prior to repainting: faulty flashing; leaking gutters; defective roof shingles; cracks and holes in siding and trim; deteriorated caulking in joints and seams; and shrubbery growing too close to painted wood. After the moisture problems have been solved, the wood must be permitted to dry out thoroughly. The damaged paint can then be scraped off with a putty knife, hand or mechanically sanded, primed, and repainted. Cracking and alligatoring are advanced stages of crazing. Once the bond between layers has been broken due to intercoat paint failure, exterior moisture is able to penetrate the surface cracks, causing the wood to swell and deeper cracking to take place. This process continues until cracking, which forms parallel to grain, extends to bare wood. 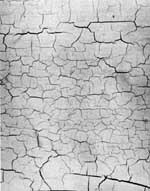 Ultimately, the cracking becomes an overall pattern of horizontal and vertical breaks in the paint layers that looks like reptile skin; hence, "alligatoring." In advanced stages of cracking and alligatoring, the surfaces will also flake badly. If cracking and alligatoring are present only in the top layers they can probably be scraped, hand or mechanically sanded to the next sound layer, then repainted. However, if cracking and/or alligatoring have progressed to bare wood and the paint has begun to flake, it will need to be totally removed. Methods include scraping or paint removal with the electric heat plate, electric heat gun, or chemical strippers, depending on the particular area involved. Bare wood should be primed within 48 hours then repainted. After having presented the "hierarchy" of exterior paint surface conditions—from a mild condition such as mildewing which simply requires cleaning prior to repainting to serious conditions such as peeling and alligatoring which require total paint removal—one important thought bears repeating: if a paint problem has been identified that warrants either limited or total paint removal, the gentlest method possible for the particular wooden element of the historic building should be selected from the many available methods. 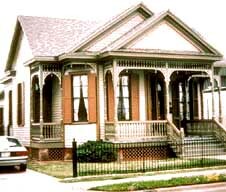 The treatments recommended—based upon field testing as well as onsite monitoring of Department of Interior grant-in-aid and certification of rehabilitation projects—are therefore those which take three overriding issues into consideration (1) the continued protection and preservation of the historic exterior woodwork; (2) the retention of the sequence of historic paint layers; and (3) the health and safety of those individuals performing the paint removal. By applying these criteria, it will be seen that no paint removal method is without its drawbacks and all recommendations are qualified in varying degrees. After a particular exterior paint surface condition has been identified, the next step in planning for repainting—if paint removal is required—is selecting an appropriate method for such removal. Abrasive—"Abrading" the painted surface by manual and/or mechanical means such as scraping and sanding. Generally used for surface preparation and limited paint removal. Thermal—Softening and raising the paint layers by applying heat followed by scraping and sanding. Generally used for total paint removal. Chemical—Softening of the paint layers with chemical strippers followed by scraping and sanding. Generally used for total paint removal. If conditions have been identified that require limited paint removal such as crazing, intercoat peeling, solvent blistering, and wrinkling, scraping and hand sanding should be the first methods employed before using mechanical means. Even in the case of more serious conditions such as peeling—where the damaged paint is weak and already sufficiently loosened from the wood surface —scraping and hand sanding may be all that is needed prior to repainting. Putty Knife/Paint Scraper: Scraping is usually accomplished with either a putty knife or a paint scraper, or both. Putty knives range in width from one to six inches and have a beveled edge. A putty knife is used in a pushing motion going under the paint and working from an area of loose paint toward the edge where the paint is still firmly adhered and, in effect,"beveling" the remaining layers so that as smooth a transition as possible is made between damaged and undamaged areas. Paint scrapers are commonly available in 1-5/16, 2-1/2, and 3-1/2 inch widths and have replaceable blades. In addition, profiled scrapers can be made specifically for use on moldings. As opposed to the putty knife, the paint scraper is used in a pulling motion and works by raking the damaged areas of paint away. The obvious goal in using the putty knife or the paint scraper is to selectively remove the affected layer or layers of paint; however, both of these tools, particularly the paint scraper with its hooked edge, must be used with care to properly prepare the surface and to avoid gouging the wood. Sandpaper/Sanding Block/Sanding sponge: After manually removing the damaged layer or layers by scraping, the uneven surface (due to the almost inevitable removal of varying numbers of paint layers in a given area) will need to be smoothed or "feathered out" prior to repainting. As stated before, hand sanding, as opposed to harsher mechanical sanding, is recommended if the area is relatively limited. A coarse grit, open-coat flint sandpaper—the least expensive kind—is useful for this purpose because, as the sandpaper clogs with paint it must be discarded and this process repeated until all layers adhere uniformly. Blocks made of wood or hard rubber and covered with sandpaper are useful for handsanding flat surfaces. Sanding sponges—rectangular sponges with an abrasive aggregate on their surfaces—are also available for detail work that requires reaching into grooves because the sponge easily conforms to curves and irregular surfaces. All sanding should be done with the grain. Recommended: Putty knife, paint scraper, sandpaper, sanding block, sanding sponge. Applicable areas of building: All areas. For use on: Class I, Class II, and Class III conditions. Health/Safety factors: Take precautions against lead dust, eye damage; dispose of lead paint residue properly. If hand sanding for purposes of surface preparation has not been productive or if the affected area is too large to consider hand sanding by itself, mechanical abrasive methods, i.e., power-operated tools may need to be employed; however, it should be noted that the majority of tools available for paint removal can cause damage to fragile wood and must be used with great care. Orbital sander: Designed as a finishing or smoothing tool—not for the removal of multiple layers of paint—the orbital sander is thus recommended when limited paint removal is required prior to repainting. Because it sands in a small diameter circular motion (some models can also be switched to a back-and-forth vibrating action), this tool is particularly effective for "feathering" areas where paint has first been scraped. The abrasive surface varies from about 3x7 inches to 4x9 inches and sandpaper is attached either by clamps or sliding clips. A medium grit, open-coat aluminum oxide sandpaper should be used; fine sandpaper clogs up so quickly that it is ineffective for smoothing paint. Belt sander: A second type of power tool—the belt sander—can also be used for removing limited layers of paint but, in this case, the abrasive surface is a continuous belt of sandpaper that travels at high speeds and consequently offers much less control than the orbital sander. Because of the potential for more damage to the paint or the wood, use of the belt sander (also with a medium grit sandpaper) should be limited to flat surfaces and only skilled operators should be permitted to operate it within a historic preservation project. Rotary Drill Attachments: Rotary drill attachments such as the rotary sanding disc and the rotary wire stripper should be avoided. The disc sander—usually a disc of sandpaper about 5 inches in diameter secured to a rubber based attachment which is in turn connected to an electric drill or other motorized housing—can easily leave visible circular depressions in the wood which are difficult to hide, even with repainting. The rotary wire stripper—clusters of metals wires similarly attached to an electric drill-type unit—can actually shred a wooden surface and is thus to be used exclusively for removing corrosion and paint from metals. Waterblasting: Waterblasting above 600 p.s.i. to remove paint is not recommended because it can force water into the woodwork rather than cleaning loose paint and grime from the surface; at worst, high pressure waterblasting causes the water to penetrate exterior sheathing and damages interior finishes. A detergent solution, a medium soft bristle brush, and a garden hose for purposes of rinsing, is the gentlest method involving water and is recommended when cleaning exterior surfaces prior to repainting. Recommended: Orbital sander, belt sander (skilled operator only). Applicable areas of building: Flat surfaces, i.e., siding, eaves, doors, window sills. For use on: Class II and Class III conditions. Health/Safety factors: Take precautions against lead dust and eye damage; dispose of lead paint residue properly. Not Recommended: Rotary drill attachments, high pressure waterblasting, sandblasting. 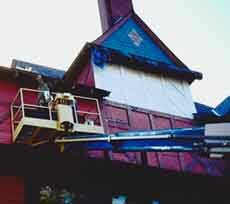 Where exterior surface conditions have been identified that warrant total paint removal such as peeling, cracking, or alligatoring, two thermal devices—the electric heat plate and the electric heat gun—have proven to be quite successful for use on different wooden elements of the historic building. One thermal method—the blow torch—is not recommended because it can scorch the wood or even burn the building down! A heat plate was used on the cornice to remove paint. Photo: NPS files. Electric heat plate: The electric heat plate operates between 500 and 800 degrees Fahrenheit (not hot enough to vaporize lead paint), using about 15 amps of power. The plate is held close to the painted exterior surface until the layers of paint begin to soften and blister, then moved to an adjacent location on the wood while the softened paint is scraped off with a putty knife (it should be noted that the heat plate is most successful when the paint is very thick!). With practice, the operator can successfully move the heat plate evenly across a flat surface such as wooden siding or a window sill or door in a continuous motion, thus lessening the risk of scorching the wood in an attempt to reheat the edge of the paint sufficiently for effective removal. Since the electric heat plate's coil is "red hot," extreme caution should be taken to avoid igniting clothing or burning the skin. If an extension cord is used, it should be a heavy-duty cord (with 3-prong grounded plugs). A heat plate could overload a circuit or, even worse, cause an electrical fire; therefore, it is recommended that this implement be used with a single circuit and that a fire extinguisher always be kept close at hand. Electric heat gun: The electric heat gun (electric hot-air gun) looks like a hand-held hairdryer with a heavy-duty metal case. It has an electrical resistance coil that typically heats between 500 and 750 degrees Fahrenheit and, again, uses about 15 amps of power which requires a heavy-duty extension cord. There are some heat guns that operate at higher temperatures but they should not be purchased for removing old paint because of the danger of lead paint vapors. The nozzle on the electric heat gun permits hot air to be aimed into cavities on solid decorative surfaces, such as this carriage house door. After the paint has been sufficiently softened, it can be carefully removed with a scraper. Photo: NPS files. Although the heat gun is heavier and more tiring to use than the heat plate, it is particularly effective for removing paint from detail work because the nozzle can be directed at curved and intricate surfaces. Its use is thus more limited than the heat plate, and most successfully used in conjunction with the heat plate. For example, it takes about two to three hours to strip a paneled door with a heat gun, but if used in combination with a heat plate for the large, flat area, the time can usually be cut in half. Although a heat gun seldom scorches wood, it can cause fires (like the blow torch) if aimed at the dusty cavity between the exterior sheathing and siding and interior lath and plaster. A fire may smolder for hours before flames break through to the surface. Therefore, this thermal device is best suited for use on solid decorative elements, such as molding, balusters, fretwork, or "gingerbread." Blow Torch: Blow torches, such as hand-held propane or butane torches, were widely used in the past for paint removal because other thermal devices were not available. With this technique, the flame is directed toward the paint until it begins to bubble and loosen from the surface. Then the paint is scraped off with a putty knife. Although this is a relatively fast process, at temperatures between 3200 and 3800 degrees Fahrenheit the open flame is not only capable of burning a careless operator and causing severe damage to eyes or skin, it can easily scorch or ignite the wood. The other fire hazard is more insidious. Most frame buildings have an air space between the exterior sheathing and siding and interior lath and plaster. This cavity usually has an accumulation of dust which is also easily ignited by the open flame of a blow torch. Finally, leadbase paints will vaporize at high temperatures, releasing toxic fumes that can be unknowingly inhaled. Therefore, because both the heat plate and the heat gun are generally safer to use—that is, the risks are much more controllable—the blow torch should definitely be avoided! Recommended: Electric heat plate, electric heat gun. Applicable areas of building: Electric heat plate—flat surfaces such as siding, eaves, sash, sills, doors. 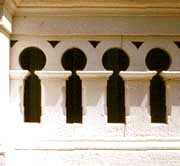 Electric heat gun—solid decorative molding, balusters, fretwork, or "gingerbread." For use on: Class III conditions. Health/Safety factors: Take precautions against eye damage and fire. Dispose of lead paint residue properly. Removing paint from detachable wooden elements such as exterior shutters, balusters, columns, and doors by dip stripping when other methods are too laborious. Because all chemical paint removers can involve potential health and safety hazards, no wholehearted recommendations can be made from that standpoint. Commonly known as "paint removers" or "strippers," both solvent-base or caustic products are commercially available that, when poured, brushed, or sprayed on painted exterior woodwork are capable of softening several layers of paint at a time so that the resulting "sludge"—which should be remembered is nothing less than the sequence of historic paint layers—can be removed with a putty knife. Detachable wood elements such as exterior shutters can also be "dip-stripped." Solvent-base Strippers: The formulas tend to vary, but generally consist of combinations of organic solvents such as methylene chloride, isopropanol, toluol, xylol, and methanol; thickeners such as methyl cellulose; and various additives such as paraffin wax used to prevent the volatile solvents from evaporating before they have time to soak through multiple layers of paint. Thus, while some solvent-base strippers are quite thin and therefore unsuitable for use on vertical surfaces, others, called "semi-paste" strippers, are formulated for use on vertical surfaces or the underside of horizontal surfaces. However, whether liquid or semi-paste, there are two important points to stress when using any solvent-base stripper: First, the vapors from the organic chemicals can be highly toxic if inhaled; skin contact is equally dangerous because the solvents can be absorbed; second, many solvent-base strippers are flammable. Even though application out-of-doors may somewhat mitigate health and safety hazards, a respirator with special filters for organic solvents is recommended and, of course, solvent-base strippers should never be used around open flames, lighted cigarettes, or with steel wool around electrical outlets. Although appearing to be the simplest for exterior use, a particular type of solvent-base stripper needs to be mentioned here because it can actually cause the most problems. Known as "water-rinsable," such products have a high proportion of methylene chloride together with emulsifiers. Although the dissolved paint can be rinsed off with water with a minimum of scraping, this ultimately creates more of a problem in cleaning up and properly disposing of the sludge. In addition, these strippers can leave a gummy residue on the wood that requires removal with solvents. Finally, water-rinsable strippers tend to raise the grain of the wood more than regular strippers. On balance, then, the regular strippers would seem to work just as well for exterior purposes and are perhaps even better from the standpoint of proper lead sludge disposal because they must be hand 'scraped as opposed to rinsed off (a coffee-can with a wire stretched across the top is one effective way to collect the sludge; when the putty knife is run across the wire, the sludge simply falls into the can. Then, when the can is filled, the wire is removed, the can capped, and the lead paint sludge disposed of according to local health regulations). Caustic strippers: Until the advent of solvent-base strippers, caustic strippers were used exclusively when a chemical method was deemed appropriate for total paint removal prior to repainting or refinishing. Now, it is more difficult to find commercially prepared caustic solutions in hardware and paint stores for homeowner use with the exception of lye (caustic soda) because solvent-base strippers packaged in small quantities tend to dominate the market. Most commercial dip stripping companies, however, continue to use variations of the caustic bath process because it is still the cheapest method available for removing paint. Generally, dip stripping should be left to professional companies because caustic solutions can dissolve skin and permanently damage eyes as well as present serious disposal problems in large quantities. If exterior shutters or other detachable elements are being sent out for stripping in a caustic solution, it is wise to see samples of the company's finished work. While some companies do a first-rate job, others can leave a residue of paint in carvings and grooves. Wooden elements may also be soaked too long so that the wood grain is raised and roughened, requiring extensive hand sanding later. In addition, assurances should be given by these companies that caustic paint removers will be neutralized with a mild acid solution or at least thoroughly rinsed with water after dipping (a caustic residue makes the wood feel slippery). If this is not done, the lye residue will cause new paint to fail. Recommended, with extreme caution: Solvent-base strippers, caustic strippers. Applicable areas of buildings: decorative features, window muntins, doors, exterior shutters, columns, balusters, and railings. Decorative features were painted with a traditional oil-based paint as a part of the rehabilitation. Photo: NPS files. Based on the assumption that the exterior wood has been painted with oil paint many times in the past and the existing top coat is therefore also an oil paint, it is recommended that for CLASS I and CLASS II paint surface conditions, a top coat of high quality oil paint be applied when repainting. The reason for recommending oil rather than latex paints is that a coat of latex paint applied directly over old oil paint is more apt to fail. The considerations are twofold. First, because oil paints continue to harden with age, the old surface is sensitive to the added stress of shrinkage which occurs as a new coat of paint dries. Oil paints shrink less upon drying than latex paints and thus do not have as great a tendency to pull the old paint loose. Second, when exterior oil paints age, the binder releases pigment particles, causing a chalky surface. Although for best results, the chalk (or dirt, etc.) should always be cleaned off prior to repainting, a coat of new oil paint is more able to penetrate a chalky residue and adhere than is latex paint. Therefore, unless it is possible to thoroughly clean a heavily chalked surface, oil paints—on balance—give better adhesion. If however, a latex top coat is going to be applied over several layers of old oil paint, an oil primer should be applied first (the oil primer creates a flat, porous surface to which the latex can adhere). After the primer has thoroughly dried, a latex top coat may be applied. In the long run, changing paint types is more time consuming and expensive. An application of a new oil-type top coat on the old oil paint is, thus, the preferred course of action. If CLASS III conditions have necessitated total paint removal, there are two options, both of which assure protection of the exterior wood: (1) an oil primer may be applied followed by an oil-type top coat, preferably by the same manufacturer; or (2) an oil primer may be applied followed by a latex top coat, again using the same brand of paint. It should also be noted that primers were never intended to withstand the effects of weathering; therefore, the top coat should be applied as soon as possible after the primer has dried. The recommendations outlined in this Brief are cautious because at present there is no completely safe and effective method of removing old paint from exterior woodwork. This has necessarily eliminated descriptions of several methods still in a developmental or experimental stage, which can therefore neither be recommended nor precluded from future recommendation. With the ever-increasing number of buildings being rehabilitated, however, paint removal technology should be stimulated and, in consequence, existing methods refined and new methods developed which will respect both the historic wood and the health and safety of the operator. Special thanks go to Baird M. Smith, AIA (formerly Chief, Preservation Technology Branch, TPS) for providing general direction in the development of the manuscript. In addition, the following individuals are to be thanked for their contributions as technical experts in the field: Royal T. Brown, National Paint and Coatings Association, Washington, D.C.; Dr. Judith E. Selwyn, Preservation Technology Associates, Boston, Massachusetts; and Dennis R. Vacca, Pratt & Lambert Co., Carlstadt, New Jersey. Finally, thanks go to several National Park Service staff members whose valuable comments were incorporated into the text and who contributed to the production of the brief: James A. Caufield, Anne E. Grimmer, Jean E. Travers, David G. Battle, Sharon C. Park, AIA, Charles E. Fisher III, Sara K. Blumenthal, and Martha A. Gutrick. The peeling paint photo used as the logo is provided, courtesy, John Leeke, Preservation Consultant, 2001, and is copyrighted. Batcheler, Penelope Hartshorne, "Paint Color Research and Restoration." Technical Leaflet 15. Nashville: American Association for State and Local History (undated). "Danger: Restoration May Be Hazardous to Your Health." The Old House Journal. Vol. 4, No. 5 (May 1976), pp. 911. Gola, Edward F. "Avoiding Mistakes in Exterior Painting." The Old House Journal. Vol. 4, No. 6 (June 1976), pp. 1, 45. "How to Assure a Satisfactory Paint Job." Scientific Section: Circular 784. Washington, DC: National Paint, Varnish and Lacquer Association (undated). Labine, Clem. "Selecting the Best Exterior Paint." The Old House Journal. Vol. 4, No. 7 (July 1976), pp. 1, 1011. Morton, W. Brown III and Hume, Gary L. The Secretary of the Interior's Standards for Historic Preservation Projects with Guidelines for Applying the Standards. Washington, DC: Department of Interior, 1979. Paint Problem Solver. St. Louis: National Decorating Products Association, 1980. "Special Issue: Exterior Painting." The Old House Journal. Vol. 4, No. 4 (April 1981), pp. 7194. Thorsen, John W. "Hazardous Waste: What is it? How to Handle it." Professional Decorating and Coating Action. Vol. 43, No. 4 (September 1981), pp. 45.